Some people enjoy ridin’ when the conditions are in their favor, other fellers enjoy ridin’ no matter what the conditions. We will call these fellers who enjoy ridin’ under any conditions Joyriders. They will ride anything just to keep from walking. They will ride in any kind of terrain just to get the job done. They don’t know any danger as long as they are horseback. They’re relaxed and pretty sure their pony can’t make a move that they can’t handle. It’s not long before a mad nervous bronc realizes that he might as well settle down, because all his anger and exertions aren’t upsetting or dislodging this happy-go-lucky trickster on his back. It’s not long before these two have gained a lot of respect for each other and start working together in order to make the day a little easier. In time with enough practice, they look like Fred Aster and Ginger Rogers making some mighty fancy moves on the dance floor. Those Joyriders who learn to take a little advantage of the horse and not scare him soon figure out how to get a lot done. 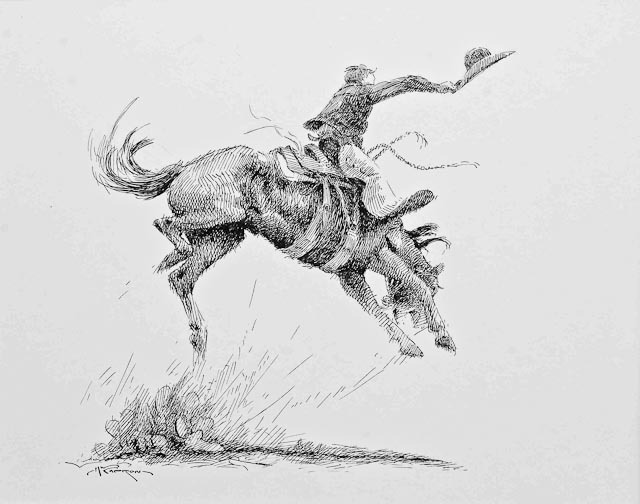 Some Joyriders are just happy to ride these energetic creatures in wild west shows or rodeos, while others will ride the bad ones just to see if they can. In the Guadalupe Mountains lives one of these Joyriders named Jack. Jack grew up ridding mules in rough country and bad horses in smooth country; it didn’t bother him at all. Years ago, Jack was asked to ride a horse I had owned named Alpo. I was a Joyrider also in that I enjoyed getting back on Alpo after he’d bucked me off. I couldn’t tie my britches on him when he decided to break in two but I managed to outlast him and he decided it was easier to pack me than it was to buck me off. I rode Alpo with an old Mexican Charro saddle that had a serape, a rawhide reata, and a machete tied to it. It didn’t matter what I tried to ride him with though, I was a goner when he made his fancy move but with miles and lots of hard ranch work he became a respectable ride; but don’t go to sleep and be careful when you pick a fight with him. Like I said, Jack was asked to ride him after I traded him to the Figure 2 Ranch and Jack had heard of Alpo’s rep. He said he didn’t have a machete, but he had an ax in the pick-up that he could tie on him and thought that would do in order to get him by old Alpo. Don’t think that these Joyriders have all been critters of the past. I know one nowadays named Travis and he’s made of the same grit as the first old bowlegs who strolled out of his cave and went down to his bronc pen. Travis doesn’t consider the day started until he’s had a good bronc ride. Measuring his grit against a cold back of a bug-eyed, whistling bronc is what he considers living. The excitement level far outweighs the common sense factor. The thrill of this challenge, with only the company of his fellow riders and God’s country as an arena, far out pays any other professional’s wages. Travis can’t believe that he is getting paid to ride and rope and eat someone else’s cooking. He doesn’t have to pay rent, join a gym club, worry about searching for an extreme sport to do in his free time or have any problem with his dress code. Life is as simple as duck soup, everything he needs is right here on the ranch according to his Cowboss. Other Joyriders I’ve known include: Billy, Andy, Dow, James, Jim, Armando, Bryan, G.R., Jason, Jeff, Jaunito, Sam, Concho, Chet, Arron, Mac and Cotton, along with multitudes that I don’t know and very few other people have heard of. Because this breed of cowboy never felt the need to seek any fame or fortune; my hat’s off to these giants. 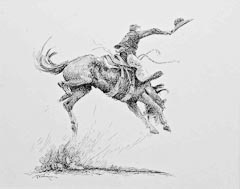 Mike Capron is a featured columnist for High Minded Horseman. He’s a veteran rancher, award winning western artist and professional cowboy. You can usually find him horseback somewhere out in the Chihuahua Desert of West Texas; working his livestock, painting and living a life we all dream of.